Yesterland photographer Chris Bales took his first trip to Walt Disney World in March 1996. He recently shared his photos from that trip with me. I went back to the same spots almost exactly 20 years later for this three-part series. , Curator of Yesterland, March 11, 2016. In 1996, Magic Kingdom Park’s New Tomorrowland was still new. Two years earlier, the clean Mid-Century look from 1971 had been replaced with a cluttered “retro” look. It was supposed to be more timeless by reflecting “yesterday’s tomorrows” instead of trying to predict the future. 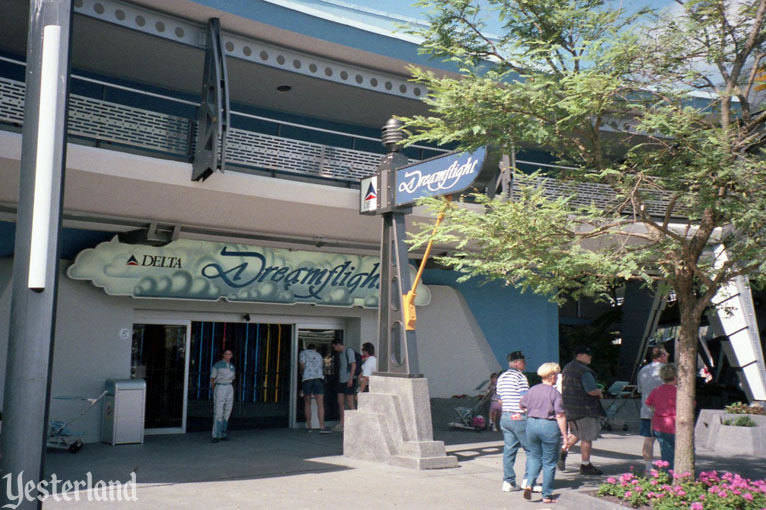 Although attractions have changed in the 20 years since 1996, the look is still similar today—just even more cluttered. More accurately, there were three attractions. The unsponsored, even-numbered attractions were essentially the same as what they replaced. In the 1996 photo, Delta Air Lines had already ended its sponsorship (January 1, 1996), but its name was still on the sign. 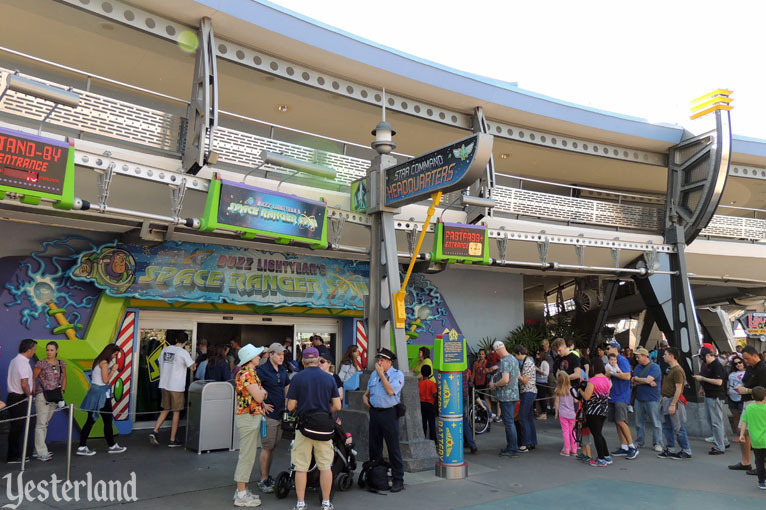 In the 2016 photo, notice that Buzz Lightyear’s Space Ranger Spin reuses the cloud-shaped sign surface from Delta Dreamflight. 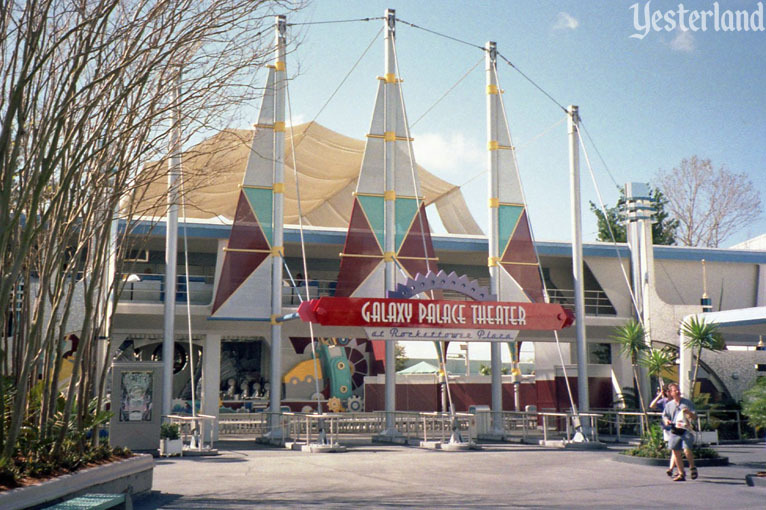 Galaxy Palace Theater was the 1994 redo of what had been the Tomorrowland Stage from 1980 until 1994. Over the years, the outdoor amphitheater hosted musical acts and character shows, including Galaxy Search and Mickey’s ’ Twas the Night Before Christmas. For some reason, Disney management eventually decided Magic Kingdom Park did not need an outdoor show space with seating—even though such amphitheaters are common features at other Disney parks. In January 2009, Galaxy Palace Theater closed permanently. It’s now backstage parking. What had originally been Space Port (a shop) became the Merchant of Venus in 1994. The name is a pun on Shakespeare’s The Merchant of Venice. 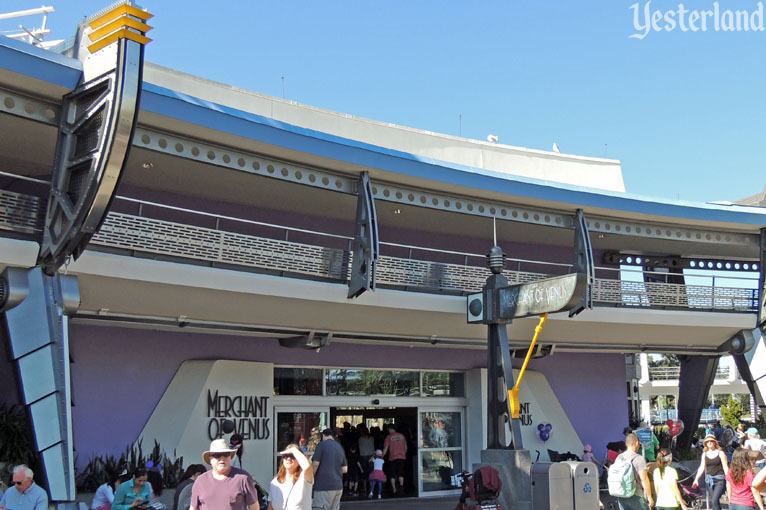 As a precursor of all the puns at Disney’s California Adventure a half dozen years later, New Tomorrowland also had Geiger’s Counter, Auntie Gravity’s, and the Lunching Pad. When Stitch’s Great Escape! opened in 2004, Merchant of Venus became a Stitch shop, without changing its name. In the 2016 photo, it’s a Star Wars shop, although you wouldn’t know it from the outside. 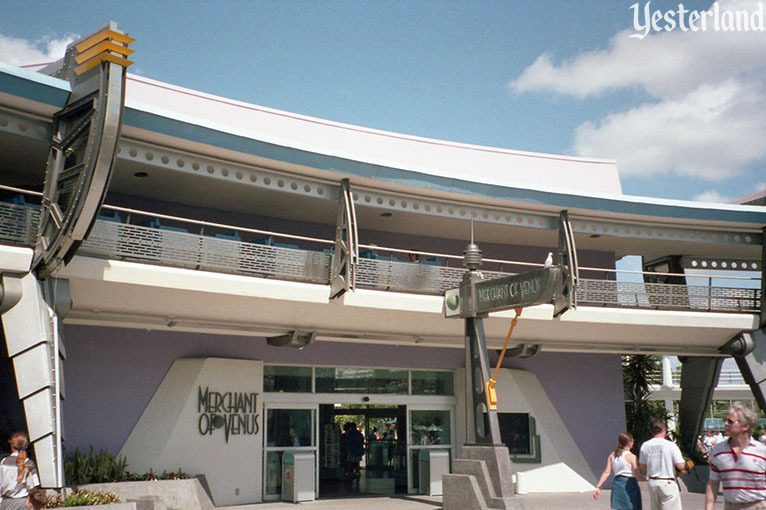 For the 1994 New Tomorrowland, the Circle-Vision 360 Theater at Magic Kingdom Park became the Transportarium, showing the Circle-Vision movie Time After Time from Disneyland Paris (edited for American audiences). The attraction featured the voice talents of Robin Williams and Rhea Perlman, along with film roles for Jeremy Irons and Michel Piccoli. Transportarium was an odd name, and having it inside the “Metropolis Science Center” made it all the more confusing. 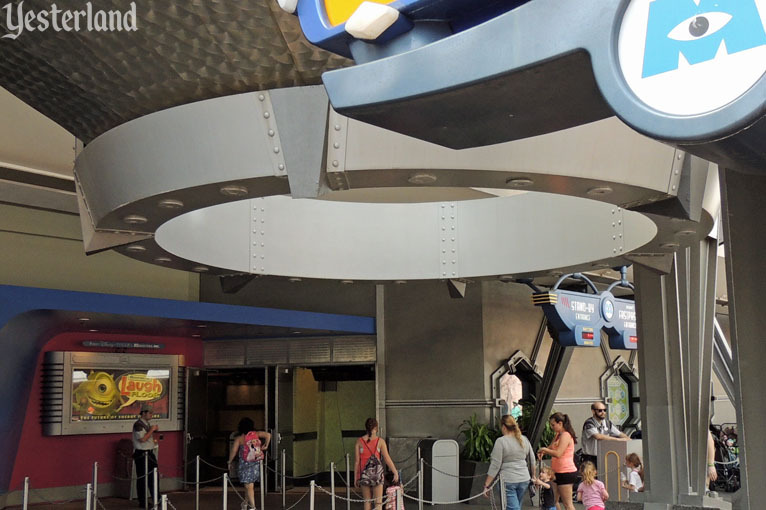 The attraction name was changed to The Timekeeper, after the robotic character voiced by Robin Williams. In 2001, The Timekeeper became a seasonal attraction. For five years, it limped along, operating only on busy days. 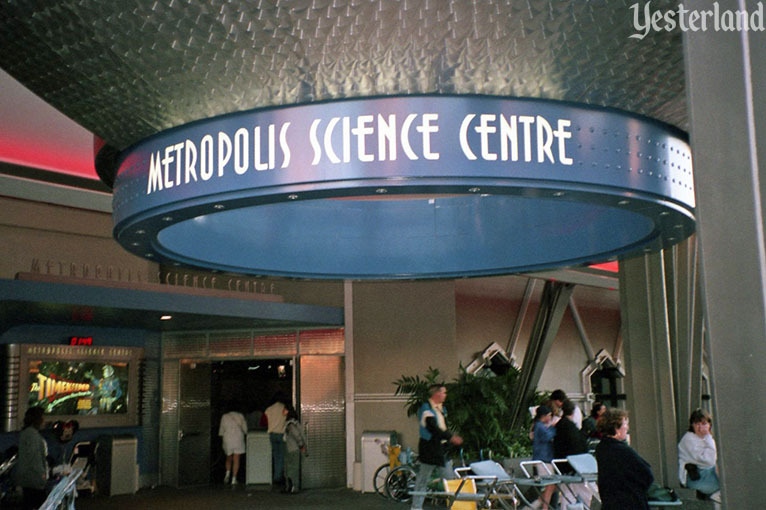 The rest of the time, the Metropolis Science Center lobby served as a character meet-and-greet location. In 2007, Monsters, Inc. Laugh Floor moved in. Mike Wazowski and his small team of animated comedians interact with guests, collecting laughs to generate power for Monstropolis. 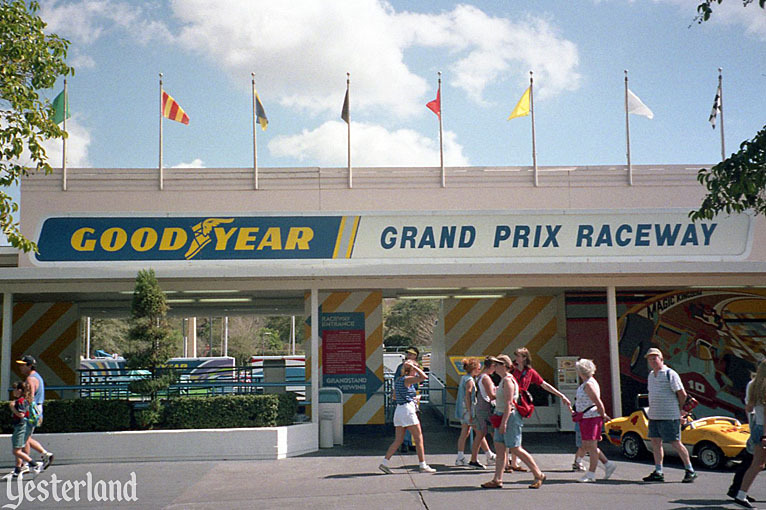 In the 1996 photo, Grand Prix Raceway, a 1971 opening day attraction, still had its original name and sponsor. Later that year, it became Tomorrowland Speedway. In 1999, as part of a strategic alliance with Indianapolis Motor Speedway, it became Tomorrowland Indy Speedway. 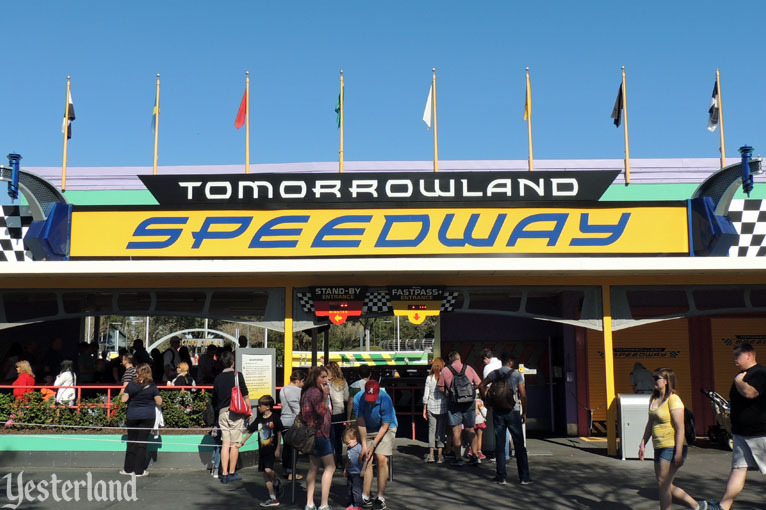 As the 2016 photo shows, it’s once again just Tomorrowland Speedway. The name reverted in 2008 when the Indianapolis relationship ended. 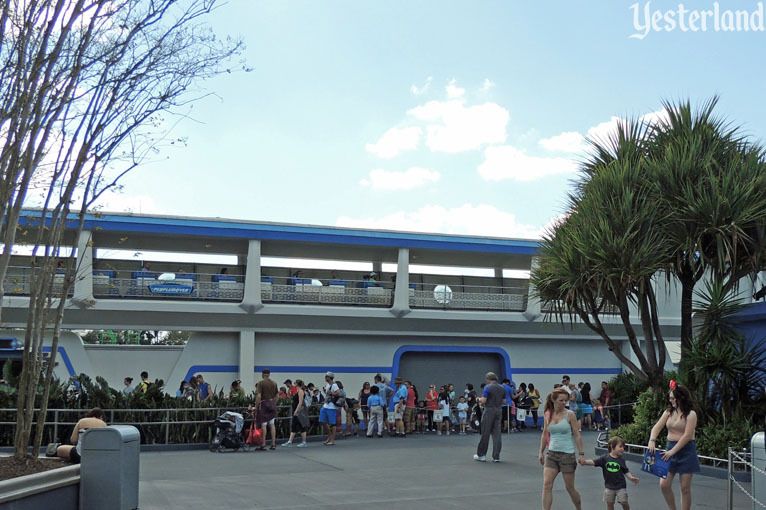 In 2010, it took on its third name, Tomorrowland Transit Authority PeopleMover, a composite of its earlier names. 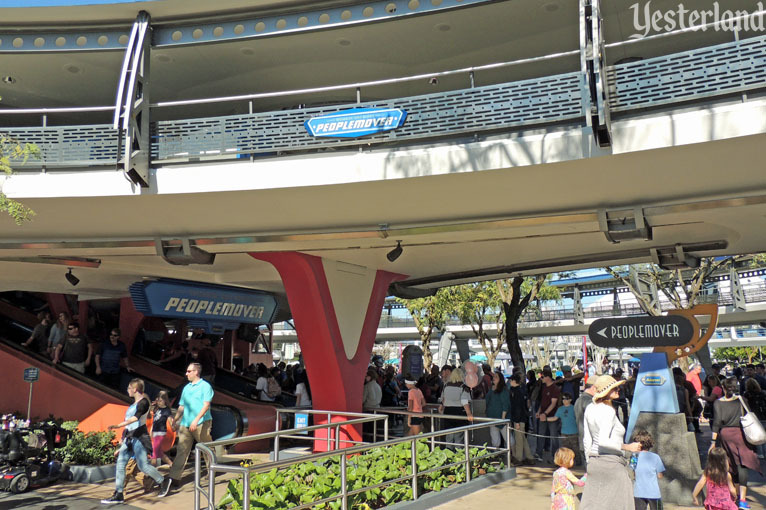 Actually, it’s more like the Tomorrowland Transit Authority PeopleMover, because the emphasis is on PeopleMover. At least Magic Kingdom Park still has its PeopleMover. 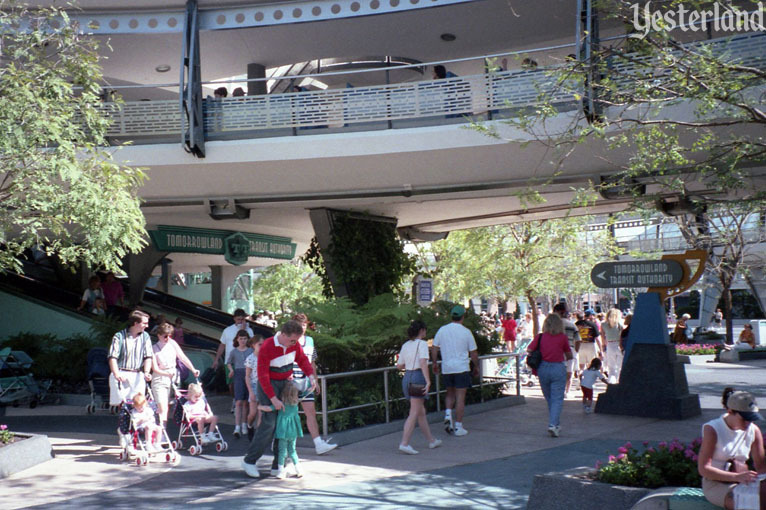 Disneyland had a superior version, but it’s been gone since 1995 (although the elevated track is still there). 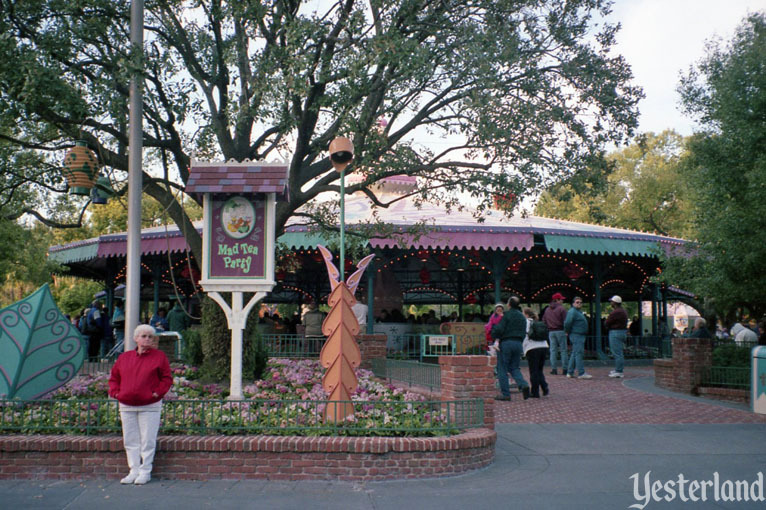 The final pair of photos takes us to Fantasyland, just beyond the edge of Tomorrowland. 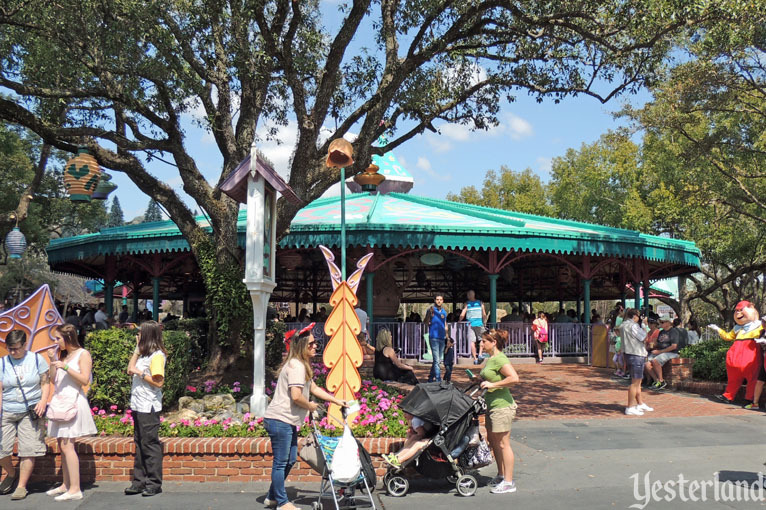 Mad Tea Party is an iconic opening day Magic Kingdom attraction that’s still going strong today—just like its counterpart at Disneyland. Unlike the open-air Disneyland version, there’s a canopy roof above the ride—a good idea, given Central Florida’s wetter climate. Unless someone saw this pair of photos, who would have remembered that the sign once faced a different direction and the color scheme on the canopy was once different?